In December 2000 I bought my first proper digital camera. It was an Olympus C3030Z. 3.1mp, 3x zoom. 4 AA batteries. At the time it was at the top end of the consumer camera market. You could get better – Kodak were making the first DSLRs – but they cost thousands of pounds. I remember going to the local branch of Jessops and slipping on ice on the way. In putting my hand out to (unsuccessfully) stop myself falling, I cut it quite badly on the rough concrete of a wall. I was in the shop with a bloody tissue wrapped around my hand. I don’t remember how much I paid for the camera but for the next two years it slowly took over from film as I used it more and more. It was smaller than my film camera, it showed me what I had done with it straight away and once I’d paid for it, it cost nothing but batteries. I was no longer thinking in terms of 24 or 36 exposures (or with medium format, 12, 10 and 8). I didn’t need to bracket anymore as I could instantly check the results. The downside, of course, was that the final image quality at the print stage wasn’t as good as film. But for what I was using it at the time, which was to illustrate a website, it was excellent. And when I did start printing images, I was able to get an A3 print from the best files, as long as I stuck to ISO 100 and used the Tiff file format. The turning point was a trip to Scotland with a mate. With were both keen photographers and both had 35mm film cameras. But during the extended tour of the North West and the Western Isles in perfect photography weather, the C3030Z grew on me and I started to really appreciate the benefits of digital photography. Eventually, it replaced the 35mm SLR in my kitbag and nestled alongside my Mamiya 645 and lenses. I found that it was useful to test exposures before committing a medium format frame. Inevitably, I decided to completely move to digital and I sold all my Pentax film gear, and the C3030Z, to buy a Fuji digital SLR. But that’s another story. Last week, I spotted an Olympus C3030Z in the window of a local camera shop. It looked in excellent condition and yesterday, on a whim, I went and asked about it. It was old stock, so technically not even second hand. It came with the memory card (Smart Media – no longer manufactured) but the rest of the accessories were missing. I made an offer of £25, which was accepted and the camera was mine. They even threw in a set of batteries. Like a kid with a new toy (I am a kid and it was a new toy, so no problem there) I was off taking snaps as soon as I left the camera shop. In some ways it was so familiar – the operation and settings menu came as second nature. In other ways, it was odd. I had forgotten how big it was, though this made it comfortable to use. I’d forgotten how big the Smart Media card was. Huge compared with today’s memory cards. It takes a long time to warm up after it’s been switched on, and the LCD screen is tiny. But it has an optical viewfinder with eyesight adjustment (which many modern cameras don’t have). I’d forgotten it has auto bracketing, which means I’ll be able to indulge in some HDR photography. Have you noticed that ‘digital’ is no longer a technology, it is now a whole philosophy. One created to make things more marketable. I can now buy a digital case for my camera. It’s actually advertised as a digital case – presumably it’s made up of lots of little ‘0’s and ‘1’s and when there’s a power failure it will crash and require rebooting. Of course, I can get a digital photo frame. I sort of get it, but in the centuries that follow us, when all the digital records are corrupted and someone finds a scrap of paper with ‘digital photo frame’ written on it, will they assume it was a programmable frame style rather than a display tool? Moving on from photography, I could get a digital ovulation test pack, and a digital pregnancy test kit. If, by some miracle, I was pregnant and delivered a bouncing baby (how hard can it be?) I can get a digital baby monitor (I can only guess that if you have an analogue baby, you need a different product. “Darling, the baby is emitting a strange sound, I think he needs rebooting”). I can buy camouflage pants in digital camo! Guaranteed invisible to the digital robot overlords, but not the analogue ones. I can get a digital compressor for inflating (I’m making a big jump here) digital tyres? Should I require feeding, a digital microwave will heat up my food. Discretely in packets of ‘0’s and ‘1’s. I assume each molecule will either be hot or cold. None of your analogue ‘luke warm’ here thank you very much.I can get a digital ceramic tong for my curly locks. And this introduces another one of those marketing ploys, because not only is the ceramic tong digital, it’s also ‘pro’. Because you wouldn’t want an amateur tong, now would you? I can get a digital Scalextric set (hmmm…) and a digital microphone for my iPad. But neither of these are ‘pro’. I’m beginning to have my doubts now. But wait, I can get a ‘pro’ electric tooth brush, a ‘pro’ electric home pedicure kit, a ‘pro’ metal threaded tap connector and a ‘pro’ steam mop. ‘Pro’ trousers, ‘pro’ low energy light bulbs and for my digital child, a ‘pro’ child seat for the car are all available. There is a serious point here. The words ‘digital’ and ‘pro’ are used by marketing people because they have become synonymous with the words ‘quality’ and ‘essential’. But most people don’t consider whether this comparison is true. So when they see these tags, they assume it must be better than before. It may be, it may not be. My point is that we are being trained to accept that it is. This attitude extends into the abstract – services are now being advertised as digital (in this case, digital usually means ‘online’, which is slightly different). I was looking into cloud computing the other day. But I had to have a good internet connection to do so, and of course if I actually wanted to work with the ‘cloud’ I’d have to have a consistently good connection. I process images on a PC not connected to the Internet – by choice as it means I don’t have to run potentially disruptive firewalls and virus checker software. So the cloud won’t work for me. The concept is good but the execution (as usual) is not quite there yet. But the government tells us digital is the way to go. So that is where we are heading and if you haven’t got a secure hold on the bandwagon, you may well fall off during the bumpy ride. By the way, all the examples of ‘digital’ and ‘pro’ above were found on one well known shopping website. Other well known shopping websites are available, all of them digital and some of the ‘pro’. An analogue camera with analogue dust. Ironically (and I didn’t spot this until I took the photos) it is labled ‘Professional’. I’ve been keen on photography for many years – you may have picked up some hints at that throughout the 238 posts I’ve published since I started blogging. When I first started taking photos, there was no digital photography. In fact. I remember seeing one of the first digital sensors during my last year of college, when we were shown one as part of the ‘what’s coming next’ part of the course. As I recall, it was being developed for satellites to use instead of film. Digital will never replace analogue. It has. The driver for this is the camera buying public, who want a cheap and easy means of recording their memories. It seems that nothing has actually happened and no one has actually been anywhere unless there is a photograph to prove it. More photographs were taken this year than in all the other years since photography was invented added together! This huge group of people finance and therefore influence the market. If you doubt that, look at how many new models of compact digital cameras are available, how often a new model is brought out and how prominent the advertising for the camera part of a mobile phone is. Film delivered more quality than the average compact camera user ever wanted, with none of the flexibility and immediacy of digital. As soon as they saw what they really wanted, the camera buying public abandoned film. Analogue is much better than digital. The key thing here is ‘what do you mean by better?’ In terms of image quality, there may be some circumstances in which this is true today. I can’t think of any, but I’m not all knowing. In any case I’d argue whether it was ‘much’ better. And there is also an argument to say that users of film have, in the main, been users of film for many years and so they are bringing a wealth of skill and experience to bear, which often makes a difference to the final product – prompting the question ‘where does the ‘better’ come from?’ But look at the names in photography – in my sphere of interest Colin Prior and Andy Rouse for example- – who have moved from film to digital. 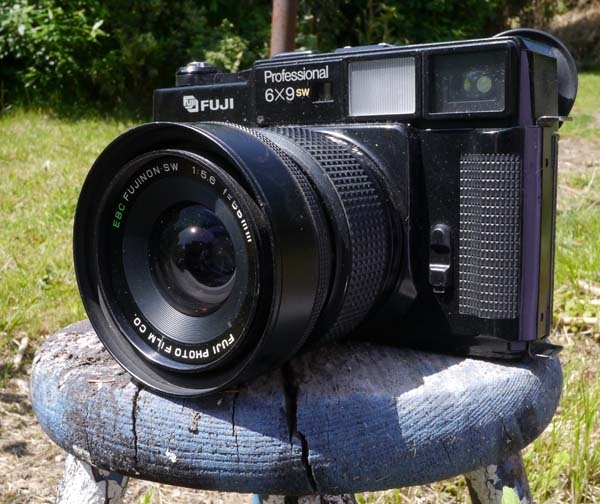 In Colin Prior’s case, he was using 6x17cm panoramic film cameras for stunning landscapes (check out his work here). In terms of usability, there is no doubt that digital cameras in whatever form are much easier to use if you consider the picture taking to picture viewing process. And they provide instant results that you can share with ease, print from a box in your local supermarket or view on your computer. There is a huge range of cameras from the simplest point and shoot (does it get simpler than the mobile phone camera?) to complex medium format sized digital SLRs. This is what the majority of users want. It’s good enough for them, which may make you splutter your tea all over the screen, but it’s reality. As a film user for more than 20 years (longer than I’ve been using digital), I finally accepted that digital gave me the quality, control and convenience I was looking for and I haven’t looked back. There is a nostalgia for film (being a bit of a kit head, I do like cameras in general, and I have a Nikon FM2 35mm SLR) but that’s not the same as regretting it’s demise. I hated the darkroom (apart from that magical moment when the image started to appear on the paper). I hated the smell of chemicals (and more importantly, my asthmatic chest hated them too) and I was often frustrated at having the ‘wrong’ film loaded in the camera. Digital doesn’t require the same high skill level as analogue. This last argument can usually be heard from die-hard film users who, unable to conclusively deny the previous two points, resort to the classic ‘it was better in my day’ approach. This says that because digital photographers can review images instantly, re-take pictures that haven’t worked and shoot hundreds of frames to guarantee a usable result, they aren’t as good as film users. It also misleads by claiming that film users never manipulated their images in any way. By implication, no film using wedding photographer or press cameraman ever had an anxious moment wondering if that never-to-be-repeated moment had been captured. And remember, we only ever see the moments that were successfully captured from history, giving film an artificial 100% success rate – think D-Day or the assassination of JFK and ask whether there would have been more and better quality images had digital cameras been available. Motor drives for 35mm cameras were essential items of equipment for press and sports photographers, so they could shoot as many frames as possible to guarantee one or two usable images. Fashion and portrait photographers machine-gunned through hundreds of frames too. Why wouldn’t they? In their budgets, film was one of the cheaper elements and as their job was to get the image, they would have been irresponsible not to. The argument that it is easy to edit a photo on a computer falls flat too. It is no easier or quicker to work on a computer than it is to work in a darkroom. The practical skills are different (although the pre-visioning and planning remain the same). But to do a decent job, you need to spend a decent amount of time regardless of medium. Where the computer adds a benefit is in initially setting up (remember ‘dilution 1:17 – divide the amount of developer you want up into 18ths?’) and being able to reproduce the effect consistently. Nothing wrong with that and, of course, the option is there for the die hard post production fan to manually go through the steps each time anyway. In my mind, this depends on why you take photographs. My experience is overwhelmingly as an amateur who enjoys the whole process from finding a subject, taking the photo, processing it on the computer and sharing it. In that respect, I love digital as I find I can learn as I go by trying something, checking it instantly and making changes there and then. I use the camera display as a means of learning and improving. My experience of professional assignments has been that I would not have been happy using film as the jobs were too important and unrepeatable to risk mistakes; out of respect and responsibility, I would choose the medium that was best suited tot he job. This attitude arises as a result of having digital equipment available; in my film days I did some band portraits and as there was no alternative, I used film. But as photography is a hobby for many, it’s about what you enjoy doing. I still fondly recall using medium format kit to take landscapes in Scotland. I’d drag what seemed like a ton of kit up some windswept hill, set everything up, spend ages getting the (manual) exposure and (manual) focussing right, wait for the light and snap. 8 or 10 exposures later (I’d always bracket with slide film, so 2 or 3 ‘scenes’) I’d have to reload. I enjoyed that too. Which is best? Two answers. Does it really matter and which ever one you prefer. But don’t preach to anyone that your preference is definitive.